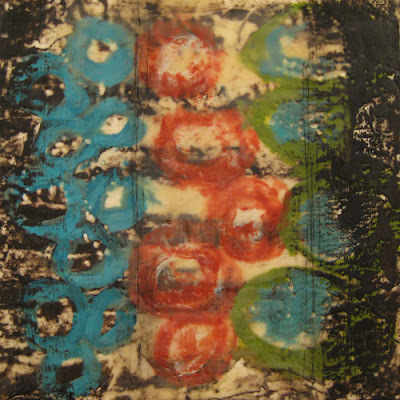 At the Horizon - Encaustic and collage on wood - 24"x24"
Reeb lives in Minneapolis, Minnesota, and has been creating art full-time for over 18 years. 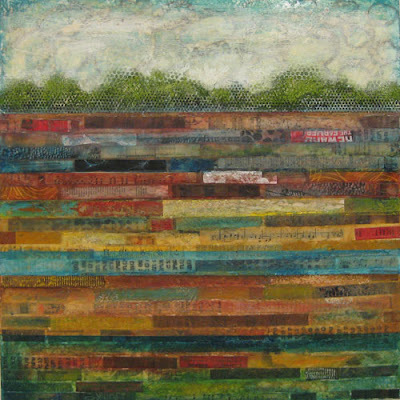 Her artwork has been shown nationally receiving numerous awards and is in many private and corporate collections nationally. She received a Bachelor’s degree in Fine Arts from the Minneapolis College of Art and Design where she instructed printmaking in the Continuing Studies program for over 9 years. 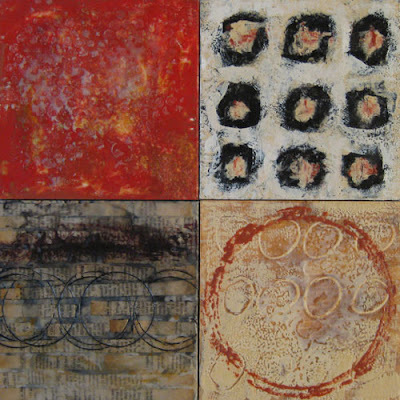 She currently teaches encaustic (beeswax) painting at the Minnetonka Center for Art. Jodi creates her mixed-media paintings from her studio at the Traffic Zone Center for Visual Art in Minneapolis, but travels to receive her inspiration, combining contrasting landscapes and environments in her work. 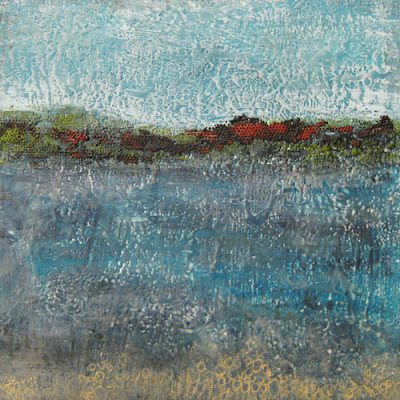 Pathway - Encaustic on wood - 12"x12"
As a mixed-media painter, I work with acrylic paint, encaustic (wax) and collage on various substrates such as canvas, wood and paper. Primarily working on commission, I enjoy collaborating with clients to create artwork that leads me to the next step in the progression of my process and development while complementing an existing space. The focus of my artwork has always been about the magnificence and beauty of nature and finding inspiration from nature’s extraordinary colors & light. As I explore this idea, I have been intrigued with nature’s ever-changing seasons . I often contemplate how nature relates to our own cycles of existence. 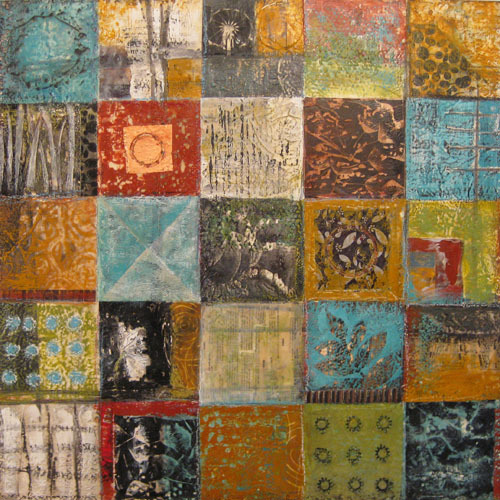 Urban Composition - Encaustic, collage on found book - 8"x10"
When I was five years old, I created drawings of animals on large sheets of newsprint paper using crayons. I rolled them up and pulled the drawings around my neighborhood to sell for a dollar. I went door-to-door and a few people bought the drawings and one person gave me a $1.00 donation. It started to rain before I got home and the remaining drawings got wet, but i didn't really care. It was in that moment I knew I wanted to be an artist and thought that it was possible. Enclosed - Encaustic and shellac on wood - 8"x8"
The best advice was given to me when I started college at MCAD by a local collector that hadn't bought any work from me yet. He told me to keep working and making art no matter what and that I would create my future that way. I sell my artwork primarily through art consultants and work on commission for healthcare, corporate and residential clients. I enjoy the challenge of creating work for specific spaces. I market myself through a careful mailing list I've compiled over the years and periodically send images of available artwork to those contacts. Facebook is a tool I use to publicize events and art openings as well as new artwork created. Recently, I created a marketing brochure that is like a book with tabs highlighting my different styles to introduce my work to art consultants and galleries nationally. Sustainable Currents - Encaustic on wood - 30"x30"
I tend to like contemporary, alternative and abstract art. Index - Encaustic, collage, image transfers and copper foil on wood - 30x30"
Yes, over 25 artists will be showing their art. Traffic Zone Artists welcome visitors into their studios for an evening to share conversation about their work in a variety of mediums including painting, sculpture, photography, installation, printmaking and drawing. 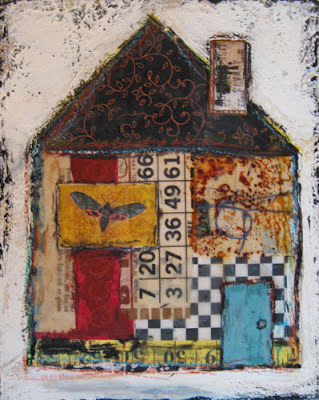 Large collage works on canvas or wood using acrylic paint and mediums and encaustic paint.